Dr. Robert Rubino brings his down to earth personality and lifestyle into everything he does, including chiropractic. He focuses on achieving the best possible results for each and every patient while maintaining a relaxed and comfortable atmosphere in the office. His philosophy toward his patients is simple: “I treat my patients the way I would want my family to be treated at any other health care provider’s office.” This is why his practice is built almost entirely on referrals from happy patients. He strives to help his patients be able to have fun, live well, and feel great! Dr. Rubino graduated from Southern Connecticut University with a Bachelor of Science Degree in Biology. Upon continuing his studies at the prestigious National College Of Chiropractic, in Lombard, Illinois, he graduated with a Doctor of Chiropractic Degree. Dr. Rubino is a member of the Foundation for Wellness Professionals and lectures extensively in the community on topics such as natural health, stress management, athletic performance, nutrition and various topics on safety at the workplace. He has been invited to speak at various corporations, health centers, schools, local civic groups, and various other businesses and organizations. He also provides his time to local charity fund raising events as a member and Past President of the Rotary Club of West Haven, and has been awarded the prestigious Paul Harris Fellow award for outstanding community service. 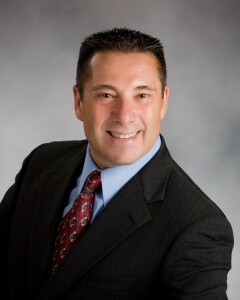 Dr. Rubino has been a District Director of the Connecticut Chiropractic Association and a member for over 20 years, and is a member of the American Chiropractic Association. He uses safe and proven adjusting techniques such as Cox Decompression Adjustment & Manipulation Technique, Neurological Relief Center Technique, and Diversified Chiropractic Adjusting. Dr. Rubino is educated in the care of pregnant, pediatric, and the elderly as well as the competitive athlete and weekend warrior. Dr. Rubino utilizes the Ideal Protein Weight Loss method to help many of his patients improve their health and to lose weight. In his leisure time, Dr. Rubino enjoys exercise and fitness, home remodeling and landscaping, outdoor activities including motorcycling, hiking and fishing, and spending time with his family and four children. If you have any questions about our West Haven chiropractor, or would like to learn more about chiropractic care at Rubino Chiropractic of West Haven, please call us at (203) 933-9404 today!